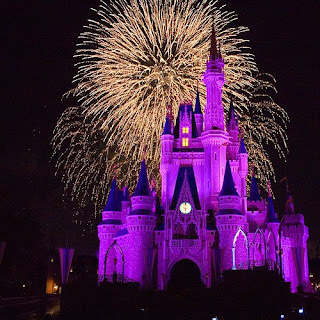 "When you wish upon a star, for a fabulous Disney vacation that's way above par"
your wish can come true as it did for my colleague Mayra without breaking into Cinderella's castle and pawning the glass slipper. A week before Labor Day holiday, Mayra Nunez took her family on a five day trip to Orlando. As a typical mother who juggles family, job, husband, pets, and grandpets, Mayra is a busy lady. She researched briefly on the Internet and discovered Dreams Unlimited, a wholesaler for Disney packages. First, the search for a hotel. Mayra came across Buena Vista Suites. They offered a suite for a rate of $85.00 a night which was a deep discount from the direct hotel rates or even Expedia.com. On a budget, the hotel suite with two rooms, two queen beds and pull out sofa, could accomodate her family of six. The offer also included breakfast. Upon her return I asked her about her trip. She said it exceeded her expectations. Not knowing anything about the hotel, the condition, "would it be an old paint-peeling building or as old as Mickey Mouse but look more like Dopey from the Seven Dwarfs? ", Mayra was very surprised. The hotel was clean, well-kept like a shiny new penny. The suite was spacious and comfortable for her clan. It kept getting better. The breakfast was a true to its name "Full American breakfast buffet". The spread included cold juices, milk, cereal, fresh cut fruit, bagels, muffins, and waffles. So the family ate a hearty breakfast and saved a bundle from eating out. A breakfast like that at Denny's alone would cost $10 a person. Then one evening, Mayra and her husband decided to enjoy a private, romantic dinner for two at the hotel restaurant. As part of their package and for staying more than 4 nights, they received a $50 certificate to the hotel restaurant. Not knowing what to expect, the meal and service rated as a high as a 3-4 star restaurant in Miami. Then the Nunez family set off for Aquatica--the newest water park in Orlando, FL which opened Memorial Day weekend this year. Sea World takes the experience of the sea, its creatures and human observation to a whole new level by inviting guests to play in, over and under the "sea". This is the first water park to feature animals from around the world. The signature features are clear sliding tubes which funnel through a lagoon of dolphins and tropical fish. It's a close encounter of the clear-plastic-tunnel kind. The park delights with total of 36 water slides, six rivers and lagoons and more than 80,000 square feet of beach area. That's Waterworld, the Caribbean and River Country all in one stop! Based on Mayra's experience, the park reached capacity on opening weekend that they closed shortly after opening time of 9am but families were camped out in line since early morning. So this time the Nunez swim team arrived early. While the park posts opening gates at 9am, they actually opened at 8am. This was the week before Labor Day. In visiting the website, who wouldn't want to ride the slides, swim in the lagoons, and flip with the dolphins. As a closet mermaid, I can't wait to unfurl my tail and swim like Ariel and sing along with Sebastian the crab "Under the Sea"--from the movie "The Little Mermaid". So add Dreams Unlimited to your collection of resource sites to check and compare for great deals in Florida. Or just bookmark this blog.